Although the Internet has changed the way that we consume and enjoy TV shows, it hasn’t done quite so much for the way they’re put together. Shifting hefty, broadcast-quality video files around online can prove impractical, so there are still a lot of tapes couriered around between production facilities, DVDs sent in the mail, and other seemingly outdated practices taking place. Evidence of that changing comes in the form of Video News Agency, a service that has just come out of beta and aims to help transform the way the media gets hold of video for use in news broadcasts. Every day, businesses and PR companies produce promotional videos that end up doing not very much at all – they might go on a company’s own website, but SKV, the company behind Video News Agency believe that these videos could do so much more. So, they launched a platform that allows anyone with a promotional video or with footage that may be useful to the media, to upload it to a searchable library and let anyone download it copyright-free for use as they wish. So far, there have been some impressive results – the producers of UK TV show The X-Factor were looking for general views of the city of Manchester for an episode, so they took some footage that had been uploaded to Video News Desk by Marketing Manchester, the company charged with promoting the city. In another example, promotional footage of a photo shoot for a controversial art exhibition was uploaded to the service. It was then used by both national and regional news in their stories about the event, as broadcasters were unable to send their own cameras. The service costs uploaders £695 ($1079) for a year’s license, plus a sliding scale price for storage, starting at £295 ($458) for 2GB. While that may seem expensive from a consumer’s point of view, this is aimed at businesses who want to get more use out of footage they’ve already shot and is actually priced at a level that should attract a solid user base. 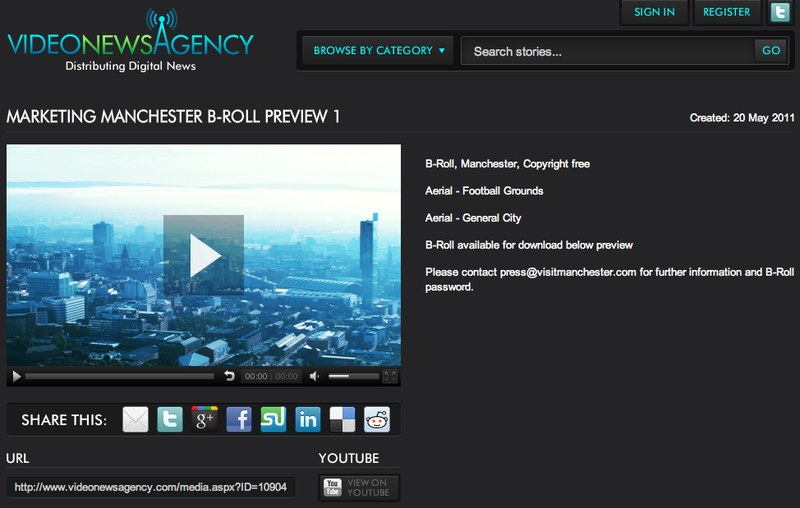 If Marketing Manchester (disclosure: I’m a former employee), for example, gets pictures of its city on TV, that’s a win even if it didn’t control exactly how they were used. Meanwhile, journalists and media outlets can sign up for free, search and download from the library, and can be sent email alerts when new footage that matches their interests is uploaded. 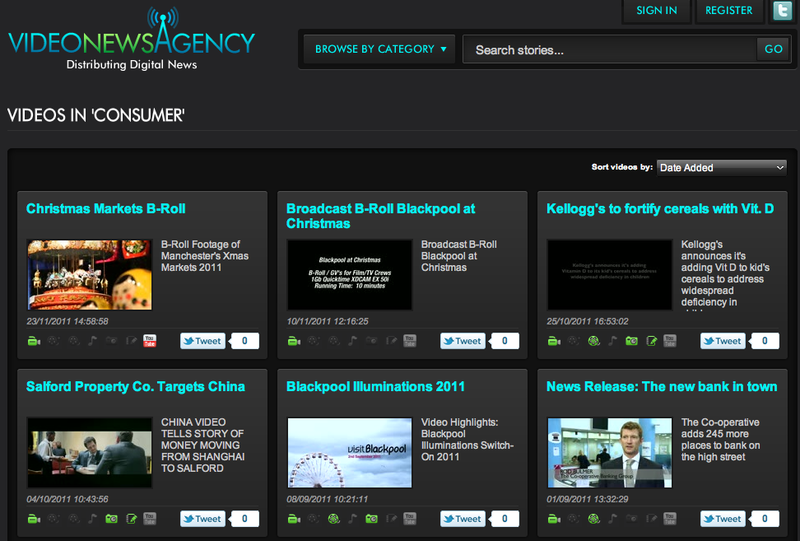 As well as being able to download files in 1080p for broadcast use, users can embed uploaded videos on Web pages too. Video News Agency was created not by a traditional tech startup, but by a PR agency trying something entrepreneurial during the economic downturn. UK-based SKV’s future plans for the service include partnerships to localise it for international markets and improved analytics so users can see more accurately who has been viewing their footage. While it’s certainly not a service for everyone, Video News Agency is an example of how the Internet is steadily transforming every niche of business there is.